January 1st is a big day for eating in Japan. It’s like Aussie Christmas, only sweeter because most of the food is cooked with lots of sugar, a natural preservative as New Year’s food or osechi is pre-prepared to last a few days (so the chef in the house can take a break from daily cooking) and kept in layered lacquered boxes called ojubako, often family heirlooms. 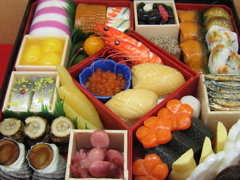 Originally, osechi was traditionally prepared at home, but now most people buy ready made up boxes from department stores and supermarkets. Each of the dishes in the osechi have meaning, like the lotus root to forsee the future (look through the holes), salty herring roe to promote fertility and the crinkly sweet black soy beans to encourage hard work until your skin is similarly black and crinkly. Mochi or sticky rice cake is also a must at new year festivities, and can be store bought dried and packaged or made by hand, a rather laborious process of steaming sticky rice and pounding it till it’s a glutionous mass. It’s a fun communal activity involving a massive wooden hammer and very good timing, as you can see from this youtube video . Mochi is eaten as a sweet (covered with sugar and soy bean powder) or grilled with soy sauce and wrapped with nori, or in a special new year’s soup called ozoni. But beware: mochi’s gluggy texture makes it dangerous. Every year, a number of kids and old folk die from mochi asphyxiation. Medical journals recommend putting your head down and hitting the back until the mochi is dislodged, but if the sufferer can’t talk, call an ambulance (in Japan, the emergency number is 110). Another sweet typically eaten at new year is hanabiramochi. 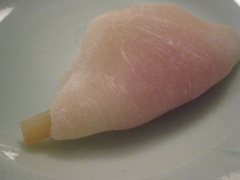 It’s a delicately pink tinged cake with a burdock root sticking out of either end, and is reputedly enjoyed by the imperial family as a part of the new year festivities. It’s a cake promoting fertility, not surprising as the imperial family’s raison d’etre is keeping their lineage going. May seem crude, but the petals represent the female and the burdock root is a phallic symbol. Most people just watch comedy programs on TV or flop around at home on new year’s day after eating too much. Or deck themselves out in kimono to visit the shrine and pay tribute to the gods the Shinto way. It’s the only day in the year when practically all commerce is on holiday in Japan, so you can even walk around Shibuya in Tokyo without being shoved. So on so many levels, New Year’s Day in Japan is bliss.